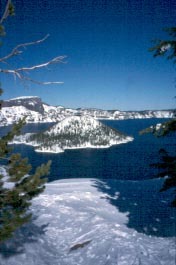 Crater Lake is a great place to xc-ski or snowshoe in the winter. The views of the lake are amazing. The roads take you to the rim of the crater. The ridge around the top of the crater make such an obvious land mark, you don't need to follow trails or stay on any one route. While on an overnight outing in February, I skied out to a high point of the ridge called the Watchman. There I dug a shelter out of a snow drift. I watched a group of 5 other campers go off and camp somewhere nearby, but out of sight. I watched the sunset over views of the Oregon Cascades while having dinner. I woke up the next morning to snow falling hard. It was almost white out. After packing my gear, I was about to have another energy bar, when through the blowing snow, I saw a group hiking out and decided to follow them. By the time I got my pack and skis on, the people were totally out of sight and their tracks were covered in blowing snow. So off I went in the direction from which I came. Within ten minutes, I caught up with them while they were taking a break. The group had grown to nine because they were helping each other find their way out. I followed suit and became the tenth to join. The weather did not let up, but the company was great. I recommend Crater Lake. If staying out over night, I recommend registering with the ranger at the visitor center.